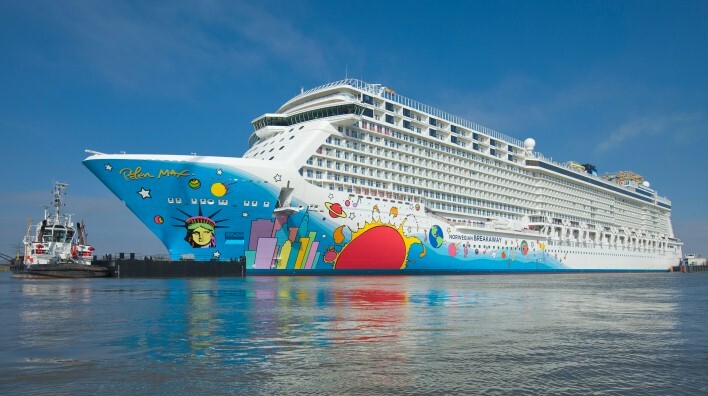 Norwegian Cruise Lines has announced that the Norwegian Breakaway will leave New York City in 2018, and move to Russia and Scandinavia. The Norwegian Escape will replace her in NYC, becoming the largest cruise ship to reside in New York. NCL revealed Wednesday that the 4,200 passenger cruise ship, Norwegian Escape, will leave Miami in early 2018 to replace the Norwegian Breakaway in NYC. The Escape will become the largest ship to ever sail out of Manhattan. It will continue the Norwegian Breakaway's 7 night Bermuda cruises until September 2018, when it will begin sailing Florida and Bahamas cruises. The Norwegian Breakaway will leave New York City for the first time on April 15, 2018 for a 12 night Transatlantic cruise to Southampton, England. The ship will sail nine day cruises to Northern Europe (Russia and Scandinavia) for the summer, although itineraries have yet to be released. Personally, I am surprised that Norwegian is moving their custom built New York ship out of New York. I feel the same way about the Escape. It is an amazing ship to sail form Miami to the Caribbean. Norwegian Gem- The Norwegian Gem will reposition to New Orleans, sailing to the Western Caribbean on seven-, 10- and 11-day cruises from the Crescent City. Norwegian Getaway- Guests sailing from Miami in winter 2018 can cruise to the Western Caribbean on the Norwegian Getaway, which will sail seven-day cruises that will also include a call to Harvest Caye. Norwegian Pearl- The Norwegian Pearl will homeport in Tampa during winter 2018, sailing seven-day cruises to the Western Caribbean. Norwegian Dawn- Norwegian Dawn will seasonally homeport in San Juan, Puerto Rico during the winter 2018/2019 season, sailing to the heart of the Southern Caribbean on 7-, 10- and 11-day cruises, with calls in Barbados, St. Lucia, Antigua and more. Norwegian Jade- Guests can also sail to the Southern Caribbean from Miami on the Norwegian Jade, on a 10-day cruise on select dates from November 2018 – April 2019. Norwegian Epic- The Norwegian Epic will return to Port Canaveral in fall of 2018, sailing seven-day Eastern and Western Caribbean cruises, along with some longer 10- and 11-day Western Caribbean cruises from November 2018 – January 2019 that will include a call at Harvest Caye. Guests who wish to visit Norwegian’s private island, Great Stirrup Cay, can do so from Port Canaveral in March 2019, as Norwegian Epic will also offer a four-day Bahamas cruise from Port Canaveral and a five-day Western Caribbean cruise that calls in Cozumel and Great Stirrup Cay.